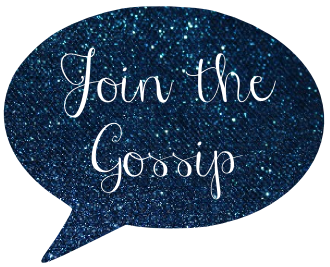 Join The Gossip: Happy Halloween! Oh my goodness, they are just adorable! Have a great Halloween weekend! Oh. My. Goodness. So precious!! I am dying!! Hope you have a great weekend! Goodness gracious alive, there is nothing cuter than babies in Halloween costumes! So many possibilities with twins . . . love it! And the name "Rich" for a baby?? SO CUTE! oh my gosh, they are so adorable! 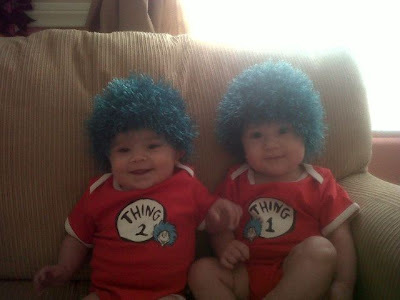 i love the Thing 1 and Thing 2 costumes! Thing 1 and Thing 2, I love it! So cute! STOP IT! Umm, this makes me want twin babies to dress up! Oh my gosh... HOW CUTE! I love the little wigs! I LOVE them!!! This just made my morning... how adorable are they in the THING 1 and THING 2 costume?! Your friend is so blessed. Double the trouble! They are soo precious! I think babies in costumes are the cutest things! The twins are so cute and love that it's a boy and a girl. That is so perfect! 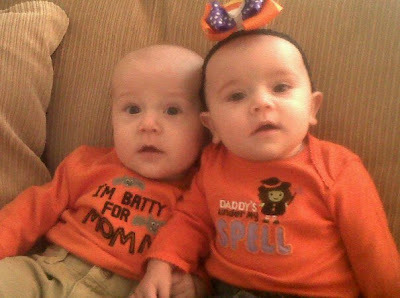 Um, seriously those are the cutest twins EVER! Love those costumes...so what I wanted to be for Halloween but they would definitely show me up!! Aw, too (or two) cute!